[M. x soulangeana], cv. (Plant Buyers Guide, Ed. 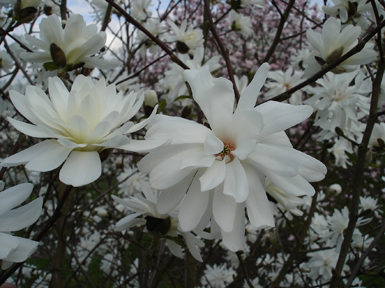 5, p. 169, 1949), cited in error from the catalog of Stephen Hoyt's Sons Co., New Canaan, Connecticut, which listed Malus parkmanii instead of Magnolia. nomen illegitimum. [M. australis], var. (Ashe) Ashe, Torreya 31: 39. 1931). basionym: M. virginiana var. parva (Ashe, Bull. Torrey Club 55: 464. 1928). May = M. virginiana var. pumila, per Ashe. [M. virginiana], var. (Ashe, Bull. Torrey Club 55: 464. 1928), leaves 2-5 in. wide; flowers small, tepals 1 in. long, 1/2 in. wide. syn. : M. australis var. parva (Ashe) Ashe, Torreya 31: 39 (1931). May = var. pumila, per Ashe. [M. maxima], cv. (van Houtte, Cat. #265: 112. 1896, Ghent, Belgium), erroneously cites a figure: The Garden of 8 December 1893, not found. Probably = M. acuminata cv. Maxima. [M. parviflora], var. - The typical variety = M. sieboldii. [M. sieboldii], cv. (Hess’ Nurseries, Wayne, New Jersey, circa 1963), in a letter dated 11 February 1963, nomen nudum. = var. sieboldii. [M. sieboldii], cv. (Otto Eisenhut nursery catalog, p. 5, 1989, Ticino, Switzerland). ‘Flowers white, semi-double.’ = M. sieboldii cv. Semi-plena. [M. foetida], F. (Ashe, Torreya 31: 37. 1931), leaves small, oblong-ovate, 15-20 cm. long, complanate, habitat: Louisiana. Probably = M. grandiflora. Compare M. grandiflora cv. Floribunda. [M. acuminata x M. veitchii 'Peter Veitch'] cv. 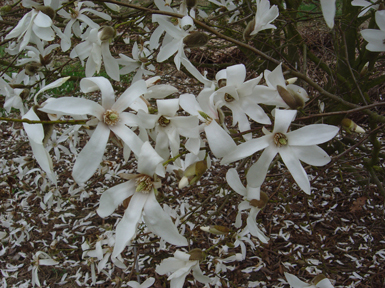 (Magnolia 35(2) [Issue 68]: 17, 2000) This spreading tree produces light pink flowers with yellow undertones late, after frost; original tree was about 6m(20ft) tall at 10 years of age; hardy to at least USDA zone 6; hybridized, grown, selected and registered (March 2000) by Dr. August Kehr. [M. x soulangeana, M. sprengeri], cv. (Registered August, 1975 by Frank B. Galyon, M.D., 715 Walnut St., Knoxville, Tennessee), a hybrid of M. sprengeri cv. Diva x M. x soulangeana (pink Lennei seedling). First flowered about 1969. 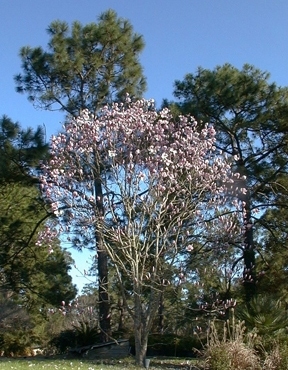 The fertile flowers, to 11 inches diameter, have 6, 7, 8 or 9 tepals, lavender-pink on exterior and white within, displayed on an upright, vigorous tree more robust than either of its parents, and maturing its annual growth earlier than M. sprengeri. [M. acuminata, M. sprengeri], cv. (Magnolia 29(2) [Issue 56]: 25, 1994). 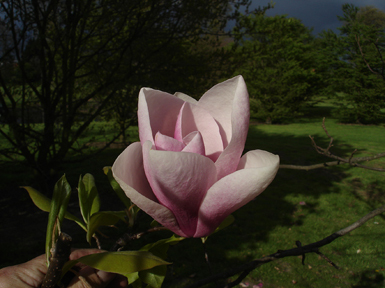 ‘This cultivar, a sister seedling of ‘Barbara Nell', results from a cross made by Phil Savage, Bloomfield Hills, Michigan, using ‘Fertile Myrtle’ as the seed parent. It was selected and registered by Richard B. Figlar, Pomona, New York. It is a fast-growing fastigiate tree (similar in habit to ‘Wada's Memory'), spreading somewhat with age. The leaves are intermediate between the two parents. The flowers are large, somewhat floppy, with a pleasant fragrance. The 9 tepals are about 5 in. long by 2 in. wide; the color is orange/red (RHS 35C to RHS 26C) on the outer surface and creamy white (RHS 20D) on the inner surface, giving the appearance of a mottled peach. 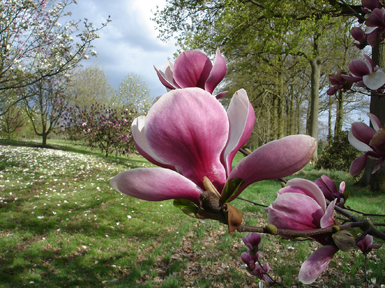 Figlar reports that it blooms in his garden in early May, about the same time as M. fraseri. The original tree is 25 feet tall in 15 years with a trunk diameter of over 12 in. It is hardy to USDA zone 6 and probably into zone 5. Registered by Figlar in June, 1994.’ (M. acuminata cv. Fertile Myrtle x M. sprengeri cv. Diva). [M. x soulangeana], cv. (J. A. Buzard, Bellevue, Washington 1954). in Arb. Bull. Univ. Wash. 22: 127 (1959), obtained from a California nursery; no information is available as yet on this clone. [M. cylindrica, M. denudata(? )], cv. (Magnolias and their allies, p. 18, 1998). ‘A large shrub or multi-stemmed tree of vase-shaped habit at first, later more spreading with arching then horizontal branches developing a crown as broad as high, 3-5 m (10-15 ft). Leaves elliptic, up to 15 x 7.5 cm, thicker in texture than those of the holotype of M. cylindrica and in shape closer to those of M. denudata and the new Shanghai form…. Flowers opening in early spring before the leaves, approximately 10 cm (4 in) long, similar in shape and poise to those of M. denudata but more slender and elongate, comprising 9 tepals, the 3 outer small and transparent, the 6 inner white suffused purplish pink outside towards the base. Fruits oblong, red, drooping.’ = M. cylindrica x M. denudata (?). [M. liliiflora, M. x veitchii], cv. (Gresham, Morris Arb. Bull. 13: 48. 1962), flowers white, base-violet, midribs of tepals striped, inner tepals upright. Outer tepals reflexed. (M. liliiflora x M. x veitchii). [M. campbellii 'Darjeeling' x M. 'Pegasus'] cv. 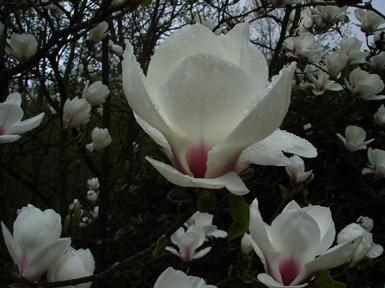 (Magnolia 40(1) [Issue 77]: 26, 2005) Flowers are tulip-shaped, fragrant (slightly medicinal scent), to 10cm (4in) long by 8cm (3in) wide, composed of 9-12 broadly spatulate to oblong-ovate tepals to 8-10cm (3-4in) long and 3.5-5.5cm (1.4-2.0in) wide; inner surface of tepals creamy white (RHS 159D), outer surface overlaid with deep reddish-pink (RHS 61B-C) at the base to paler pink (RHS 65A) at the apex, but with a darker midrib; overall impression of flower color is dark pink (RHS 63B); inner whorl of 3-4 tepals clawed at base; outer whorl not clawed; stamens numerous, 20mm (0.8in) long by 2mm (0.08in) wide; filaments and anther connectives dark reddish-purple (RHS 63A); gynoecium 3cm long, styles dark reddish-pink (RHS 63A); pedicel 1.0-1.2cm long, green with villous pubescence; perules two, greenish-brown with yellowish villous pubescence; leaves finely pubescent on midrib and secondary veins only; leaf blade elliptic to obovate, 22cm (8.6in) long by 9cm (3.5in) wide; petiole to 4cm (1.5in); selected and named in 2003 by Jim Gardiner of RHS Wisley from seedlings raised by Peter Dummer. [M. x soulangeana, M. x veitchii], cv. (Magnolia 20(1) [Issue 37]: 18, 1984). ‘A Gresham hybrid with large leaves and wide open flowers to 10 inches across; 9 broad tepals. Reddish stamens and gynoecium.’ Registered by Ken Durio, Opelousas, Louisiana. (M. x veitchii x M. x soulangeana cv. Rustica Rubra). [M. acuminata x M. denudata] cv. 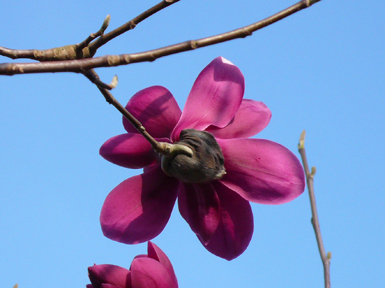 (Magnolia 40(1) [Issue 77]: 23-24, 2005) Flowers of this hybrid are 9-11cm (3.54-4.33in) long with three sepaloids and six petaloids; sap-green (RHS 150C) triangular, acute sepaloids fall early and are 5cm (1.97in) long and 1.1-1.6cm (0.43-0.63in) wide; petaloids of outer whorl are spatulate, 8-10cm (3.15-3.94in) long and 4.8-6.2cm (1.89-2.44in) wide, canary-yellow (RHS 9D), basally and appear Naples yellow (RHS 11B) or (RHS 144C) when young; stamens many, 1.5-1.8cm (0.59-0.71in) long and pale yellow except at abaxial side of the filaments which is purplish-pink; gynoecium green and stigmas pale yellow; hardy in USDA zone 7-8; presumed to originally have been hybridized by Phil Savage; raised by Karl Flinck, Bjuv, Sweden bearing his accession number 1636; selected from Flinck garden by and subsequently named and registered (November 9, 2004) by Koen Camelbeke and Philippe de Spoelberch of Arboretum Wespelaar, Belgium. 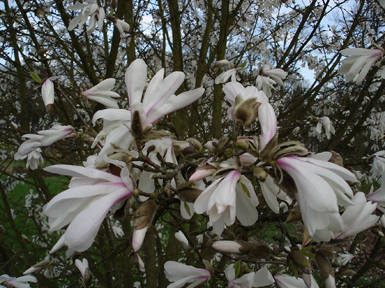 Name and description of this plant previously published by Camelbeke, K. 2004 Jaarboek Belgische Dendrologische Vereniging 2003:41. [M. campbellii, M. sargentiana], cv. (Magnolia 33(1) [Issue 63]: 31, 1998). ‘This hybrid is a very vigorous plant with large leaves similar to those of campbellii. Flowers are reddish purple outside and pale pink inside. The original tree is 50 feet tall and 50 feet wide at 38 years from seed. 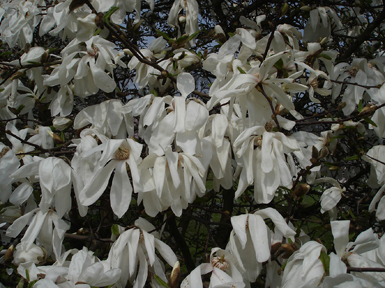 Selected in 1991 and under propagation at Burncoose and Southdown Nursery, this cultivar was selected by F.J. Williams, Esq. at Caerhays Castle. Registered by Philip Tregunna in July 1997.’ = M. sargentiana cv Robusta x M. campbellii [pink form]. [M. acuminata], cv. (J. C. McDaniel, 1964, Urbana, Illinois), Original tree on John F. Keeler Farm, Philo, Champaign Co., Illinois. This is described as exceptional in being highly self-compatible and producing a large crop of viable seeds. Autumn foliage yellow. Flowers typical, suggested for grafting as a seed source and pollinator. It has been grafted onto M. hypoleuca by Princeton Nurseries of Princeton, New Jersey. Registered on 12 Dec. 1969. [M. acuminata x M. campbellii] cv. 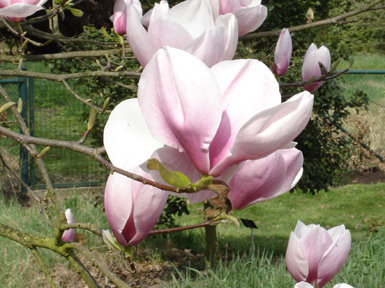 (Magnolia 36(2) [Issue 70]: 19, 2001) The flowers of this hybrid are 20.3-25.4cm (8-10in) across with a nice cup-and-saucer form; the exterior of the flowers is deep rose pink and the interior is a lighter pink; the tree bloomed after withstanding -29C (-20F); this hybrid has moderate seed and excellent pollen fertility; hybridized by Phil Savage and registered in July 2001 by Dennis Ledvina. [M. x soulangeana], cv. 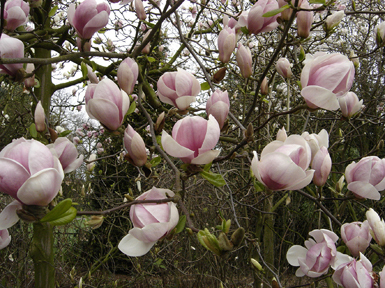 (Pickard, Magnolia Gardens, Price List, Autumn 1966, Canterbury, England), large pink to white ... new.’ = cv. Brozzonii. [M. denudata], cv. (Wada, Hakoneya Nurseries, Yokohama, Japan). question no. 1, Newsl. Amer. Magnol. Soc. 3 (1): 8 (1966), nomen nudum. Per Grootendorst, Dendroflora 4: 67 (1967) = M. x soulangeana cv. Picture. [M. x soulangeana], cv. (Wada, Jap. Gard. Treas. p. 36, circa 1925, Hakoneya Nurseries, Numazu-Shi, Japan), as M. conspicua cv. Picture: ‘possibly a hybrid with (M). soulangeana (cv). Nigra ... flowers darkest or even darker black purple on the exterior...white on the interior...of the thickest texture...substance and of the largest size...’ see Dendroflora 4: 67 (1967). [M. x veitchii], cv. (Wada, Jap. Gard. Treas.p. 36, circa 1925, Hakoneya Nurseries, Numazu-Shi, Japan), as M. conspicua cv. Picture. = M. x soulangeana cv. Picture. [M. macrophylla], var. (Parmentier, Bull. Sci. France & Belg. 27: 254. 1896), nomen nudum. But on p. 196, described with leaves ovate, to 32 cm. long, 10 cm. wide, densely pubescent beneath. as ‘Pilossima’ in index on p. 336. [M. stellata], cv. (Kelsey & Dayton, Stand. Pl. Names, Ed. 2, P. 377. 1942), per synonymy = cv. Rosea. In Armstrong Nurseries, Cat. p. 44 (1948), Ontario, California, with flowers opening rosy-pink, fading to a lighter, more delicate shade. cv. Rosea. [M. x soulangeana], cv. (Hess’ Nurseries, Wayne, New Jersey), listed in a letter dated 11 February 1963. nomen nudum, to John M. Fogg, Jr. Probably = cv. Pink Alba Superba. [M. 'Helen Fogg' x M. 'Northstar'] cv. 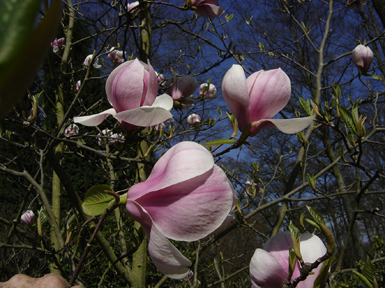 (Magnolia 36(2) [Issue 70]: 19, 2001) The persistently upright flowers of this hybrid have 12 tepals with inwardly cupping tips; tepals are bright pink outside and a lighter pink inside; this hybrid has fair seed and excellent pollen fertility; registered in July 2001 by Dennis Ledvina. [(M. x soulangeana 'Alexandrina') x M. 'Galaxy'] cv. 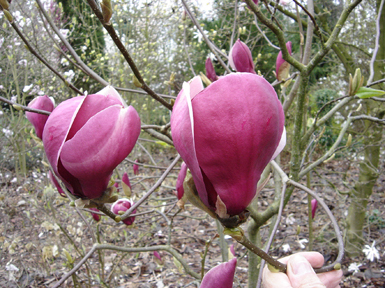 (Magnolia 36(2) [Issue 70]: 19, 2001) This hybrid produces extremely fragrant flowers of a good, solid pink and is extremely seed and pollen fertile; registered in July 2001 by Dennis Ledvina. [M. obovata], cv. 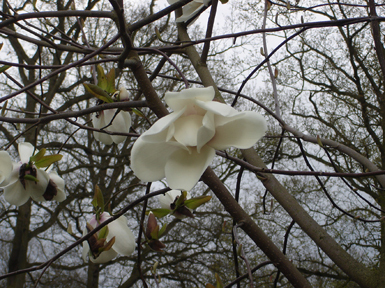 (Gardiner, J. M. Magnolias, p. 133, 1989). Nomen nudum. AM (Windsor, 1971). [M. x soulangeana, M. x veitchii(? )], cv. (Otto Eisenhut nursery catalog, p. 2, 1989, Ticino, Switzerland). ‘G66-12.’ Nomen nudum. [M. virginiana], cv. (Magnolia 33(1) [Issue 63]: 31, 1998). ‘An open-pollinated seedling from a disjunct population of this species in Gloucester, Massachusetts, ‘Pink Halo’ is similar to the typical var. virginiana, but the flowers have a pale pink-colored ring at the bottom of the tepals. This is best seen on the inside of the tepals. Selected and named by Richard B. Figlar, Pomona, New York, and registered by him in March, 1997.’ M. virginiana var. virginiana. [M. x loebneri 'Encore', self-pollinated] cv. 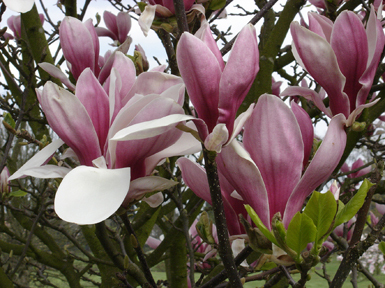 (Magnolia 35(2) [Issue 68]: 17, 2000) This slow growing, bushy, floriferous tree produces lilac-pink flowers with more pink coloration in cooler weather; flowers have 42-48 tepals; hardy in USDA zones 5-7; hybridized, raised, selected (1987) and registered (1999) by Dr. August Kehr; previously identified as #R14-29 in Dr. Kehr's collection. [M. stellata], cv. listed without description in 1974-1975 wholesale price list of Tom Dodd Nurseries, Semmes, Alabama. [M. x soulangeana], cv. (Marsh Nursery, Pasadena, California, circa 1961), per Univ. of California at Los Angeles Botanic Garden, 1961. in Sunset Western Garden Book, Ed. 3, p, 334, 1967, flowers large, deep pink, white inside, early, Probably = cv. Pink Alba Superba. [(M. liliiflora x M. sprengeri 'Diva') x (M. acuminata x M. 'Picture')] cv. 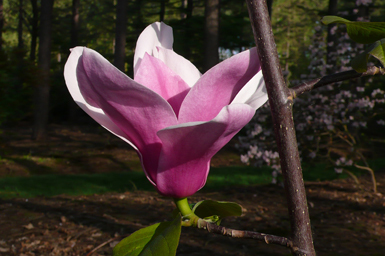 (Magnolia 36(2) [Issue 70]: 20, 2001) This hybrid produces large, wide-tepaled bright pink flowers; many secondary buds prolong the bloom period for up to a month; the tree bloomed after withstanding -32C (-26F); this hybrid has fair seed and excellent pollen fertility; registered in July 2001 by Dennis Ledvina. [M. liliiflora, M. stellata], cv. (Dudley & Kosar, Morris Arb. Bull. 19: 27. 1966), late blooming, flowers large, 5-7 in. in diameter, buds stout, red-purple (RHS 70A-70D), tepals 9-12, obovate-spatulate, red-purple (RHS 71A-74C), inside white (RHS 155D), stamens 50-60, reddish-purple (71B). A sterile triploid. U.S. Natl. Arb. #28351. (M. liliiflora cv. Reflorescens x M. Stellata cv. Rosea). [M. grandiflora], cv. (William Curtis, Wil-Chris Nurseries, Sherwood, Oregon, before 1967). cultivated at U. S. Natl. Arboretum #30265. Original tree in Oregon City, Oregon. Described by introducer as hardy, but with leaves not so dark as those of cv. Victoria. [M. globosa, M. virginiana var. australis], cv. (Callaway, Dorothy J. The World of Magnolias, p. 225, 1994). ‘This hybrid was created by the late D. Todd Gresham in 1965 at his home, Hill of Doves, in Santa Cruz, California. ... ‘Procelain Dove’ was selected and named by Tom and Bill Dodd from hybrids Gresham shipped to their nursery in Semmes, Alabama. The leaves are much like those of M. virginiana and are semievergreen (Gresham must have used M. virginiana var. australis in his cross, although he did not list it as such). The flowers also resemble those of M. virginiana but are larger and quite fragrant. 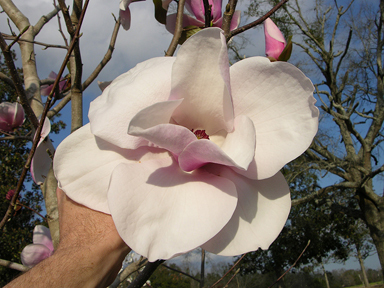 This hybrid received its name for its porcelain-white flower color and in honor of Todd Gresham's home, Hill of Doves. Named in 1986.’ (M. globosa x M. virginiana). [M. praecocissima], var. - the typical variety = M. kobus. [M. grandiflora], cv. (Nurseries, San Francisco Bay region, 1907), per Riedel, 1957. A. & E. Kay, Pl World Fla. 33 (1933), very dense, upright form. Leaves large, strongly nerved, undulated, oblong-ovate, 15-19 in. long, 4-6 in. 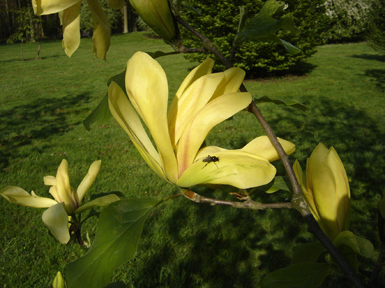 wide, yellowish-brown beneath; flowers very large and deliciously fragrant. [M. grandiflora], cv. (Nurseries, San Franciso Bay region, California circa 1907), per Riedel, Pl. Extra-trop. Reg. 383, 384 (1957), nomen nudum. cultivated in 1961 by D. Todd Gresham, Santa Cruz, California and the University of California at Los Angeles. [M. grandiflora], cv. (Henry J. Hohman, Kingsville Nurseries, Kingsville, Maryland, circa 1961), listed in a letter to Dr. John M. Fogg, Jr., dated 14 October 1961, as still flowering. Some years it blooms into late November, protected by his house. introducer raised it as a seedling of cv. Praecox. [M. grandiflora], cv. (Nehrling, My Garden in Fla. 104. 1944), growth upright, pyramidal; foliage similar to that of the former (cv. Praecox Du Grand Jardin) only a little smaller and of still lighter green. Flowers very large. [M. grandiflora], cv. (Sprenger, Boll. R. Ort. Bot. Palerm. 1: 66, 1897), Cultivated by Pravert of Padova, Italy from Seed in 1886. form pyramidal, leaves sub-auriculate, flower-tepals 9, white, fragrant, fruit carmine-red. In Pampanini, Bull. Soc. Tosc. Ort.41: 187 (1916), precocious flowering habit, small tree, branches numerous, erect; leaves thick, ovate, flowers rather small. [M. grandiflora], cv. (Nehrling, My Garden in Fla. 1040 1944), from Italy. Probably = cv. Pravertiana. [M. grandiflora], cv. (Besant, Gard. Chron. 66: 365, Fig. 165. 1929), nomen nudum. Cultivated at Glasnevin, Dublin, Ireland. syn. : M. parviflora cv. Precoce Des Nantes, fig, 165 caption on p. 363, in error, possibly this = cv. Nannetensis. [M. parviflora], cv. (Gard. Chron. 86: 363, fig. 165. 1929), Fig. 165 caption in error. = M. grandiflora cv. Precoce des Nantes. This possibly = M. grandiflora cv. Nannetensis. [M. sieboldii] cv. 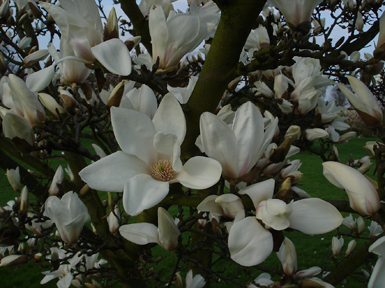 (Magnolia 36(2) [Issue 70]: 20, 2001) This tetraploid selection produces white flowers about 12.8cm (5in) across with 10-14 tepals. 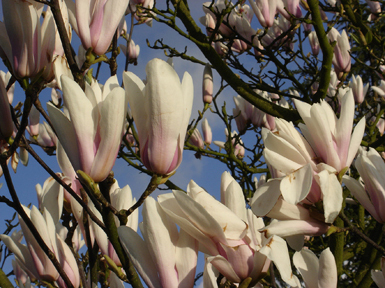 The original tree was 3m (10ft) tall by 3m (10ft) wide, multi-stemmed and bushy at 13 years of age; similar in appearance to M. sieboldii 'Colossus'; functions well as a female parent in crosses with evergreen magnolias; created, named and registered (2000) by Dr. August Kehr; previously identified as #17-6 in Dr. Kehr's collection. [M. campbellii, (unknown)], cv. (Jour. Roy. HORT, Soc. 99: 273. 1974), given as M. cv. Princess Margaret. Received F. C. C. 17 April 1973. Seedling of M. campbellii var. alba hybridized with unknown. 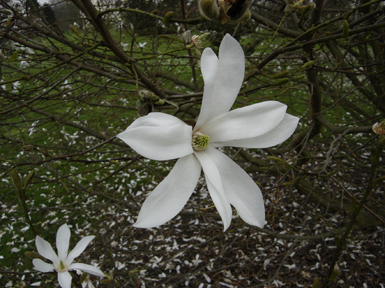 Tree from 1957 seed, 20 ft. high in 1973, flower to 11 in, across, has petals from 3 1/4 to 5 in. long by 2 1/4 to 3 in. wide; outside shading from red purple 578 to C to D and inside cream tinged with red purple group 68D; numerous stamens tinged red purple group 70C outside. 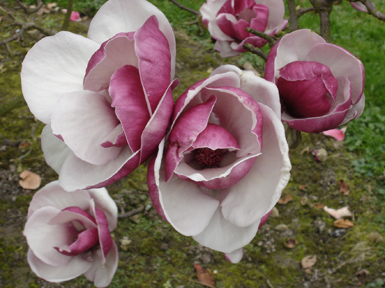 deeper flower color with larger, less rounded petals than in cv. Charles Raffill. Scales of flower bud very hairy, with long silky hairs. Exhibited by crown estate commissioners, the Great Park, Windsor, Berkshire, England. [M. denudata, M. stellata], cv. (Magnolia 20(1) [Issue 37]: 18-19, 1984). ‘This pure white hybrid has more tepals than heptapeta [here, denudata], but retains the erect habit. Traces of pink in the ‘Waterlily’ parent do not come through.’ J. C. McDaniel, University of Illinois, Urbana, Illinois (Newsl. Amer. Mag. Soc. 15(2): 27-28, 1979). (M. stellata cv. Waterlily x M. denudata). [M. x proctoriana], var. - the typical variety. [M. pumila], var. - the typical variety = M. coco. [M. virginiana], var. (Nuttall, Amer. Jour. SCI. 5: 295. 1822), as M. glauca var. pumila. Leaves elliptic, acute. ‘A dwarf variety not exceeding three or four feet.’ Habitat: East Florida. [M. liliiflora], cv. (Kelsey & Dayton, Stand. Pl. Names, Ed, 2, p. 376. 1942), per synonymy = cv. Nigra. In Plant Buyers Guide. Ed. 5, P. 169 (1949) = cv. Purpurea. [M. x soulangeana], cv. (Kelsey & Dayton, Stand. Pl. Names, Ed. 2, P. 377. 1942), And in Plant Buyers Guide, Ed. 5, p. 169 (1949), per synonymy = cv. Rustica rubra. [M. x soulangeana], cv. (Otto Eisenhut nursery catalog, p. 2, 1989, Ticino, Switzerland). Nomen nudum = M. x soulangeana cv. Deep Purple Dream. [M. liliiflora, M. x soulangeana], cv. (Magnolia 20(1) [Issue 37]: 19, 1984). ‘Has 6 tepals and no sepals. Tepal length 3-4 inches, width 3 inches. Flowers globular, similar in shape to ‘Lennei.’ Both outside and inside of the flowers colored the dark purple of ‘Nigra.’ Registered by Frank B. Galyon, Knoxville, Tennessee (Newsl. Amer. Mag. Soc. 12(2): 3, 1976). (M. liliiflora cv. Nigra x M. x soulangeana cv. Lennei). [M. x soulangeana], cv. (Pitkin, Arb. Bull. Univ. Wash. 10 (4): 14. 1947), flowers purple or purple-red. In Armstrong Nurseries, Cat. p. 44. 1948, Ontario, California, as cv. 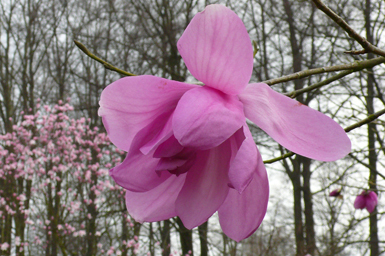 Purple ('Purple Saucer Magnolia'), ‘the big blooms are lilac-purple on the outside and pastel mauve on the inside.’ Probably = cv. Rustica Rubra. [M. denudata], cv. (Roy. Hort. Soc., Camellias And Magnolias, Conference Report, p, 102, 1950), a purple-eyed variety is mentioned, but no name is given it. nomen nudum. [M. denudata], cv. see M. x soulangeana cv. Purpliana. [M. x soulangeana], cv. (Sawada, Natl. Hort. Mag. 29: 56. 1950), flowers reddish-purple, tepals 9, blooms early. plant cultivated at Overlook Nurseries, Crichton Station, Mobile, Alabama. See Newsl. Amer. Magnol. Soc. 2 (1): 2 (1965) and 7 (1): 4, 5 (1970). Probably cv. of M. x soulangeana. [M. denudata], var. (Maximowicz) Rehder & Wilson in Sargent, Pl. Wilson. 1: 401. 1913), only Japanese plants (not the Chinese). basionym: M. conspicua var. Purpurascens (Maximowicz, Bull. Acad. Sci., St. Petersb. 17: 419 (1872). syn. : M. purpurascens IHRIG. [M. denudata], var. (Sensu Rehder & Wilson in Sargent, Pl. Wilson. 1: 401. 1913), The Chinese plants (not the Japanese). = M. sprengeri. [M. sprengeri], cv. (Stapf, Bot. Mag.. 152: T. 9116. 1927) = cv. Diva, per Johnstone, Asiatic Magnol. 83 (1955). [M. denudata], var. (Curtis) Schneider, Ill. Handb. Laubh. 1: 330. 1905) = M. liliiflora DESR. [M. liliiflora], cv. (Curtis, Bot. Mag. 11: t. 390. 1797), as M. purpurea. Layritz, Arb. Bull. Univ. Wash. 10 (4): 11 (1947), says that it comes from China. W. B. Clarke, Arb. Bull. Univ. Wash. 11 (1): 23 (1948), says it is nothing but plain M. liliiflora. Per Bean, Trees & Shrubs Brit. Is. 2: 279 (1951), flowers larger than the type, wholly purple outside, very deep purple towards the base of the petals. [M. virginiana], cv. (Bosse, Vollst. Handb. Blumeng., Ed. 2, 2: 464. 1841), as M. glauca var. pygmaea. Described as evergreen, dwarf form. Compare var. parva and var. pumila. [M. auriculata], var. (Bartram) Nuttall, Gen. N. Amer. Pl. 2: 18. 1818) = M. pyramidata. [M. fraseri], var. (Bartram) Torrey & Gray, Fl. N. Amer. 1: 43. (1838) = M. pyramidata bartram. [M. grandiflora], cv. (Nehrling, My Garden in Fla. 103. 1944), pyramidal, dense, leaves of medium size, brownish beneath. flowers large. [M. pyramidata], var. - the typical variety. [M. umbrella], var. (Bartram) Parmentier, Bull. Sci. France & Belg. 27: 253, 336 (1896) = M. pyramidata. [M. wilsonii], cv. (Bentley, Jour. Roy. Hort. Soc. 73: 266, Fig. 97. 1948). Possibly of hybrid origin involving M. sinensis which was growing near to M. wilsonii. See Johnstone, Asiatic Magnol. T. 12 opposite p. 124 (1955). [M. campbellii], cv. (Magnolia 20(1) [Issue 37]: 19, 1984). ‘Flowers 9 inches across, rich red-purple on the outside, paler inside when fully opened’ (Newsl. Amer. Mag. Soc. 15(1): 20, 1979).